Have you hugged your radio today? 13 February 2018 is World Radio Day – a day to celebrate radio as a medium: to improve international cooperation between broadcasters; and to encourage major networks and community radio alike to promote access to information, freedom of expression and gender equality over the airwaves. For more visit World Radio Day. UNESCO (United Nations Educational, Scientific and Cultural Organisation) has declared the 13th February as World Radio Day. As Africa’s oldest community radio station project we at Bush Radio fully support this intiative as we believe in the power of radio to help build communities and improve lives. Whether it is through our Children’s Radio Education Workshop (CREW) launched in 1996 where young people learn to use the medium to develop their skills and understanding of media or one of our programmes like Sakhisizwe – Bou die Nation, Build the Nation or even our specialised music programmes like Blues in the Bush where we connect the music to its roots in Africa – radio plays a vital part in almost everyone’s daily life. 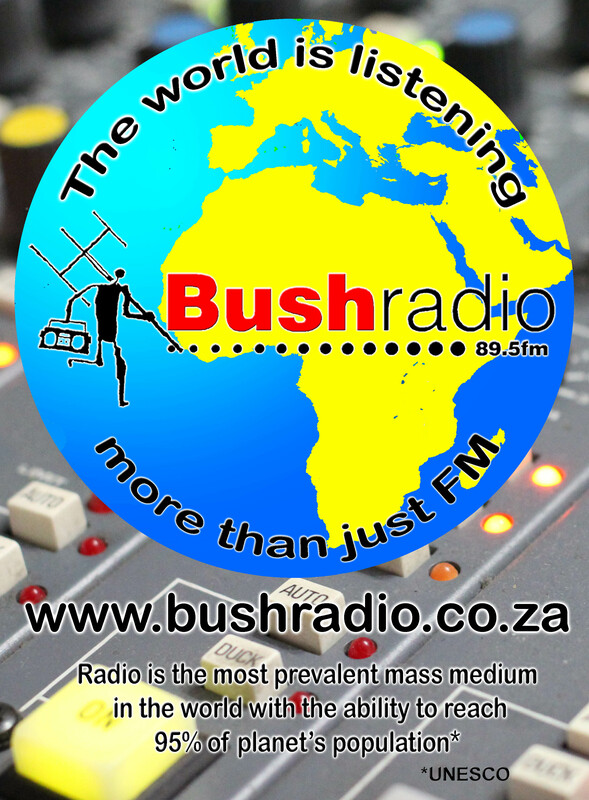 Through technology like internet streaming Bush Radio is able to connect to the entire planet with it’s audience not just from Cape Flats but with dedicated listeners in Asia, Europe and the Americas tuning into the station online through computers or mobile phones, Bush Radio truly is more than just FM radio. 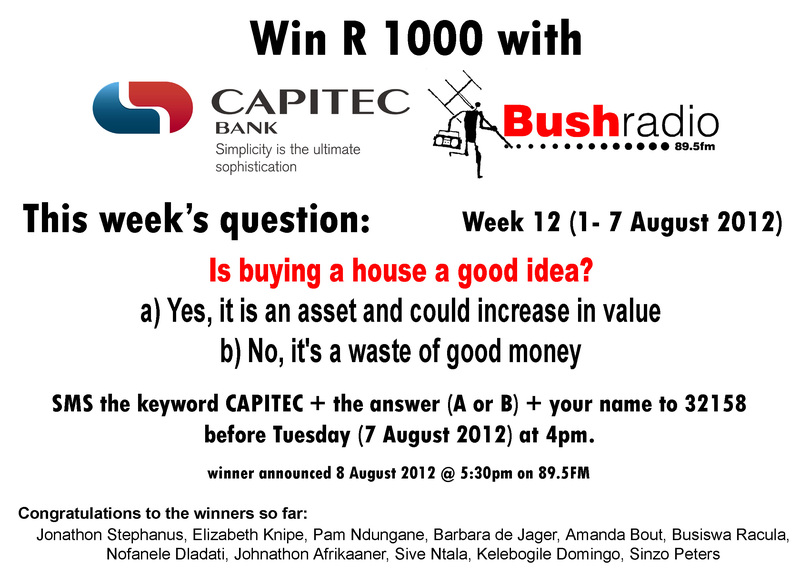 Bush Radio is embarking on a pilot project to get feedback on our programmes. We need 10 to 15 people to form part of a listener group. NB! You will need to be able to listen to one programme per day (Monday to Friday) for 15 days and have access to MXIT. Listening to the station can be done via 89.5FM / www.bushradio.ndstream.net . You will be given more information as to how to participate. UNESCO (United Nations Educational, Scientific and Cultural Organisation) has declared the 13th February 2013 as World Radio Day. As Africa’s oldest community radio station project we at Bush Radio fully support this intiative as we believe in the power of radio to help build communities and improve lives. Congratulations to our Bush Radio / Capitec winners who have each won R 1000 into a Capitec account by listening to the “Money Wiz” feature and participating in our sms draw over the past 12 weeks. Final chance to win R1000 – enter now! 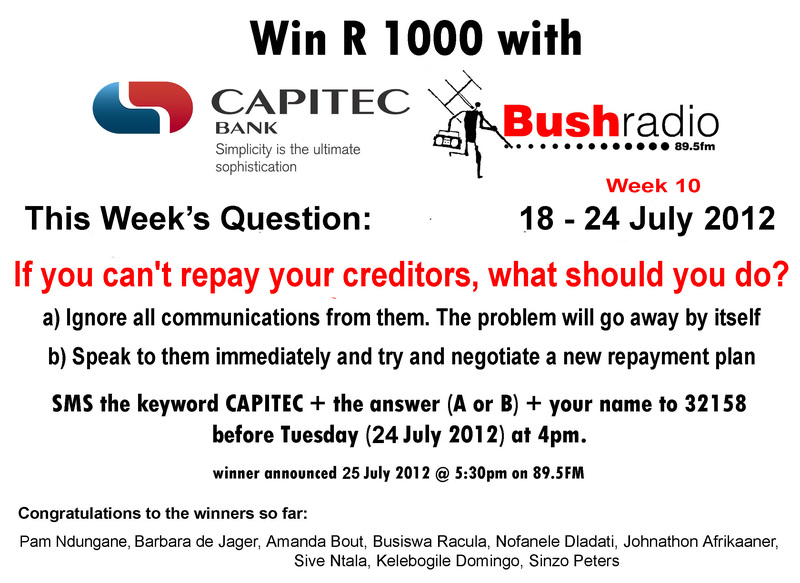 It is the last week to win R 1000 in the Bush Radio / Capitec competition – so don’t forget to get your entry in for this week by Tuesday the 7th August 2012. Is buying a house a good idea? Sms cost R1 each and free minutes do not apply. Where is the best place to find a registered debt counselor? If you can’t repay your creditors, what should you do? 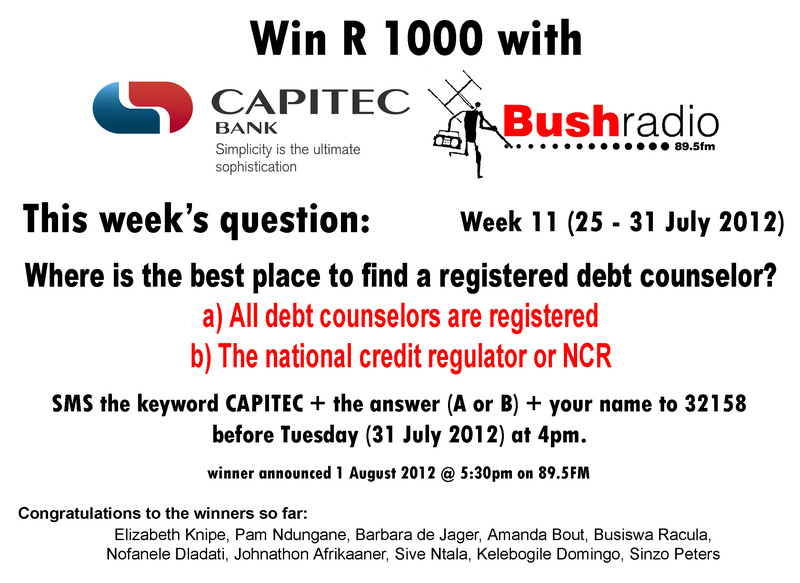 Ready to win R 1000 this week? 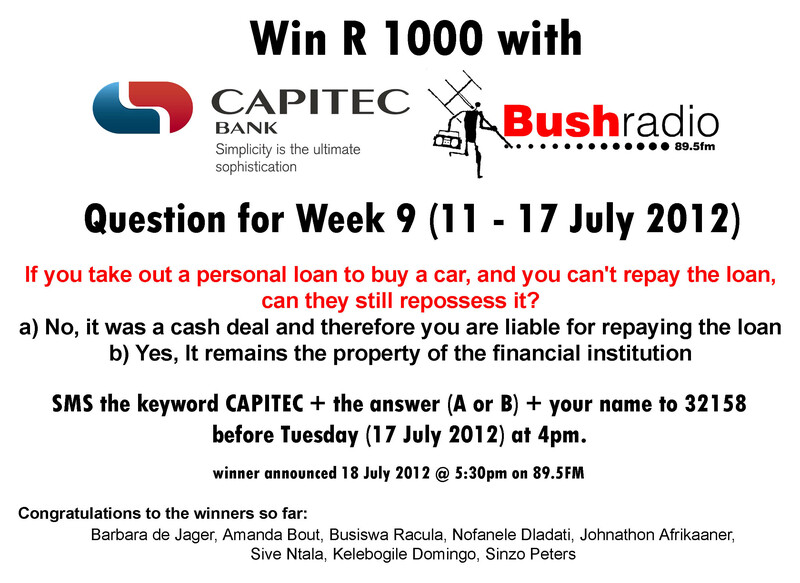 If you take out a personal loan to buy a car, and you can’t repay the loan, can they still repossess it?